A stone marker welcoming people in the town of Groton. But some residents took issue with the message. 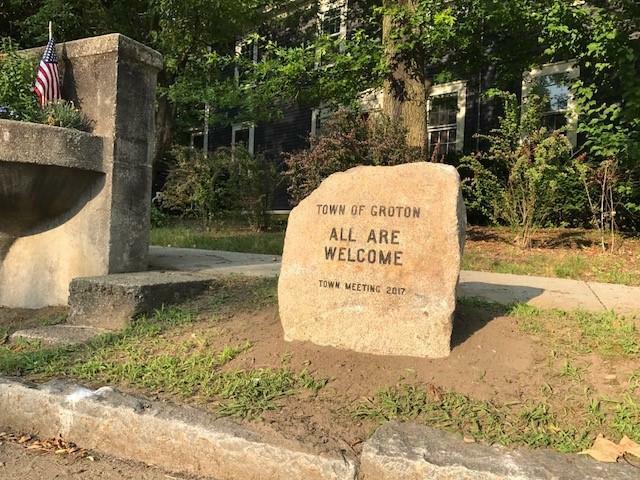 They asked that the inscriptions be changed to “Welcome,” or perhaps “Welcome to Groton.” The issue, it seems, was with the word “all” and how the message might be interpreted. Last December, Jack Petropoulos, a member of the town’s Board of Selectmen, interviewed locals to see what their town could do to show good will. To Petropoulos, the markers seemed like a harmless idea, and the issue passed 140 to 113 at the spring Town Meeting. But on Aug. 28, a group submitted a petition to reopen discussion on the stones at the fall Town Meeting. They wanted the wording changed, the word “all” removed. “That harmless little word is what we’re talking about,” Petropoulos said. On Monday evening, residents voted at Town Meeting by an “overwhelming” margin to keep the markers as they are, he said. Petropoulos said he was gratified by the town’s decision. One of the Groton residents who was uncomfortable with the markers, Jack Saball, 67, said he feels the markers’ message implies an immigration stance not everyone agrees with. He suggested changes that take a more neutral tone. Saball, a former Groton selectmen and retired police captain, said since the signs sit on public property they should not be political. He said the spring Town Meeting didn’t have enough discussion. “My goal is to get this discussed,” Saball said, before the meeting. Robert Gosselin, who served as town moderator of Groton from 1973 to 2012, wrote a letter to the editor in the Groton Herald in early September. He too was concerned about the approval process for the markers and felt that citizens weren’t given the right to speak in opposition. A symbolic commitment of $1 was put forth at the spring Town Meeting for the markers, and Groton provided the granite for free. The town raised close to $4,000 in private donations for the cost of engraving the eight stones, and buried time capsules under the stones that included essays by local students. Students wrote about what “all are welcome” means to them. In a separate letter to future residents, town officials explained why they chose to place these markers around the town. On Oct. 5, the town held a ceremony to install the final stone. It was set near a busy road at the entrance of the New England Shirdi Sai Temple, a 40,000-square-foot Hindu house of worship in its final stages of construction off Route 119. It’s expected to open in November. Members of the new temple sponsored the stone. Aimee Ortiz of the Globe staff contributed to this report. Cristela Guerra can be reached at cristela.guerra@globe.com. Follow her on Twitter @CristelaGuerra.